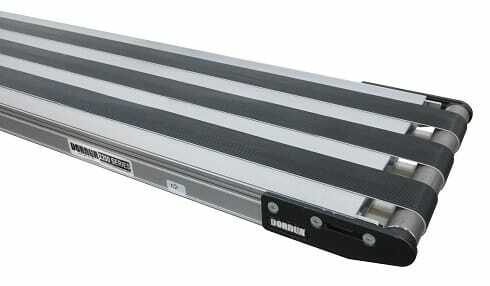 A high friction belt is useful when moving potentially slippery product. But in some cases, this provides a challenge when removing the product from the belt. This issue arose recently with a company transporting flat cards on a conveyor. The indexing conveyor needed to stop in front of worker stations so that the cards could be hand-picked off of the belt. Because of the high friction belt and the flatness of cards, it was difficult to remove them from the conveyor. To solve this issue, Dorner created a modified 2200 Series Conveyor with a split belt. This allowed the employees better access to pick up the cards while allowing the company to only purchase a single conveyor. The conveyor was equipped with three pieces of belt and each belt section has its own v-guide to ensure proper tracking and accuracy.